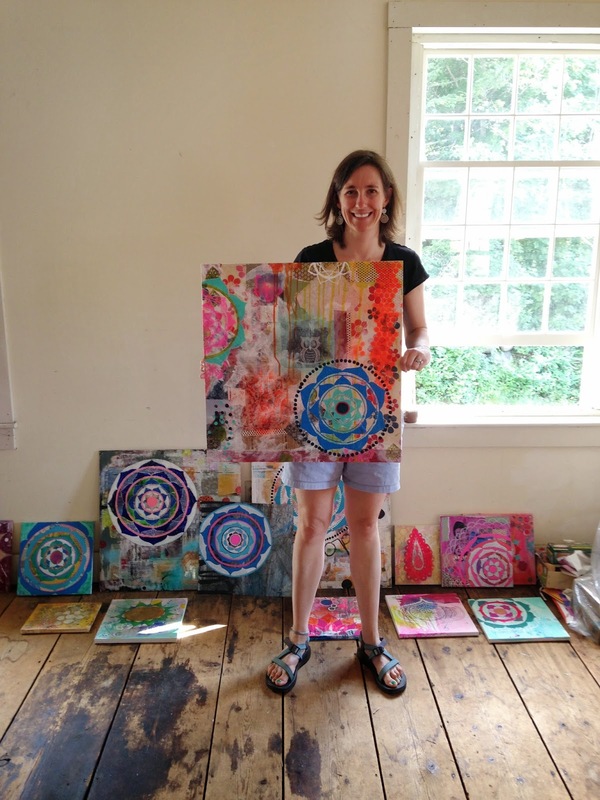 I'm thrilled to announce that I am offering an upcoming day-long Layered Mandala Painting workshop right here in Charleston. It will be held in the centrally located Park Circle neighborhood of the city, in a creative private home with lots of indoor and outdoor space where we can work in the sunshine if we choose! Our host Rachael James, Integrative Wellness Coach, mama of 4 and Paleo inspired cook will be cooking up an amazing wholesome nutritious feast for us to lunch on. We'll be gathering as a circle of women, declaring our intentions for the day and then immersing ourselves in delicious art making. It will be a truly transporting, inspirational and satisfying day! Where: Charleston, in the neighborhood of Park Circle, at a large private home in this area of the city known for its funky vibe. 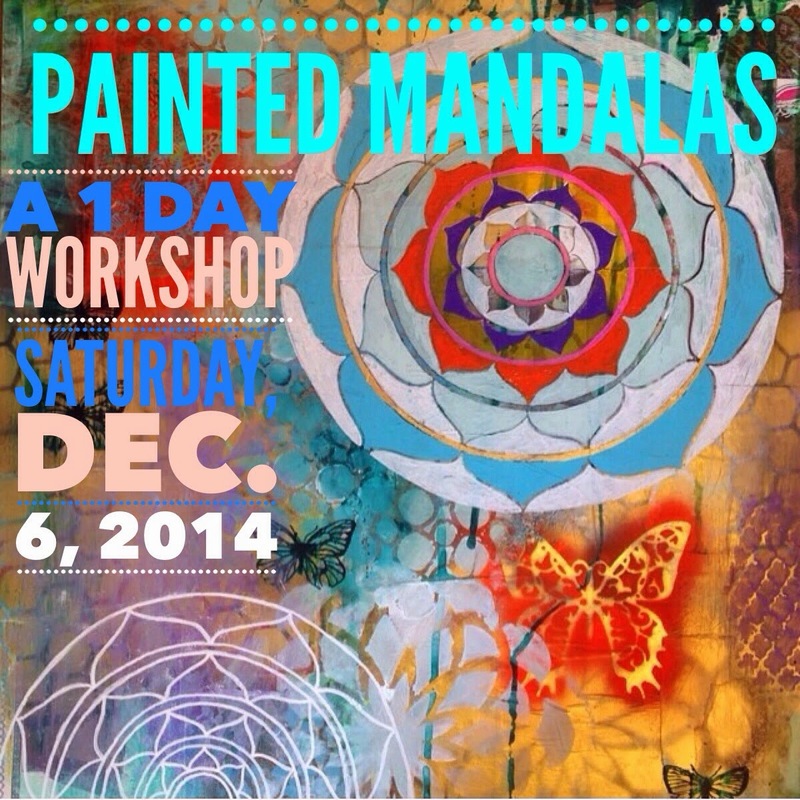 What's included: All materials to create your own large 2 by 2 foot layered Mandala painting, a gift bag full of special treats from Faith and your host Rachael; bits of our art along with things to inspire and use in your project, a delicious catered nutritious lunch, coffee, water and tea all day. 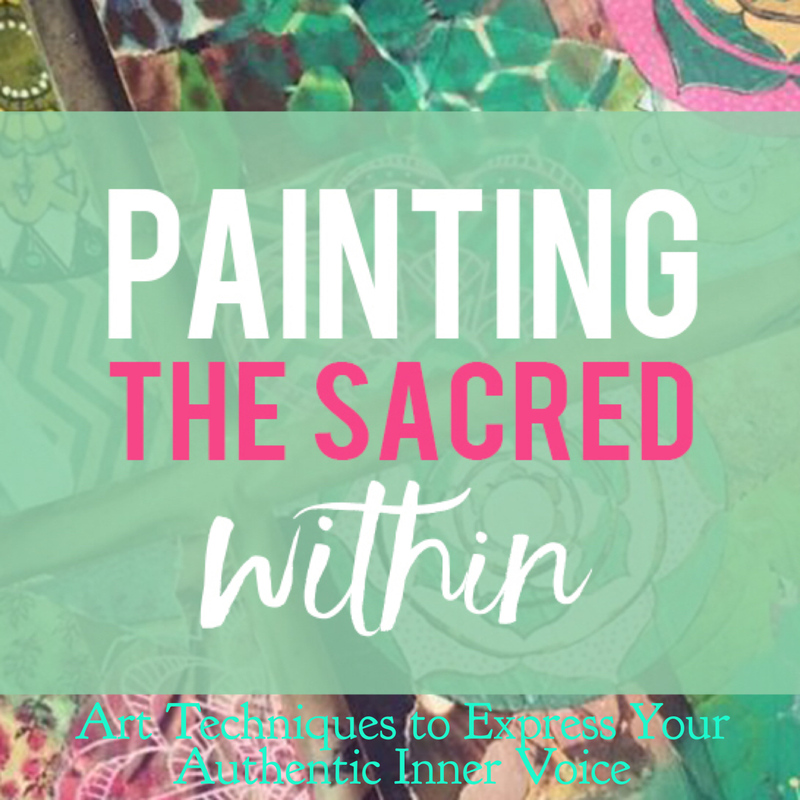 Join us for a soul-filling day long workshop in Charleston, South Carolina, where we will gather as a group of women, declare our intentions for the day and then immerse our selves in delicious papers and paints for 6 wonderful hours of creating art together with a break at noon for a yummy catered lunch. 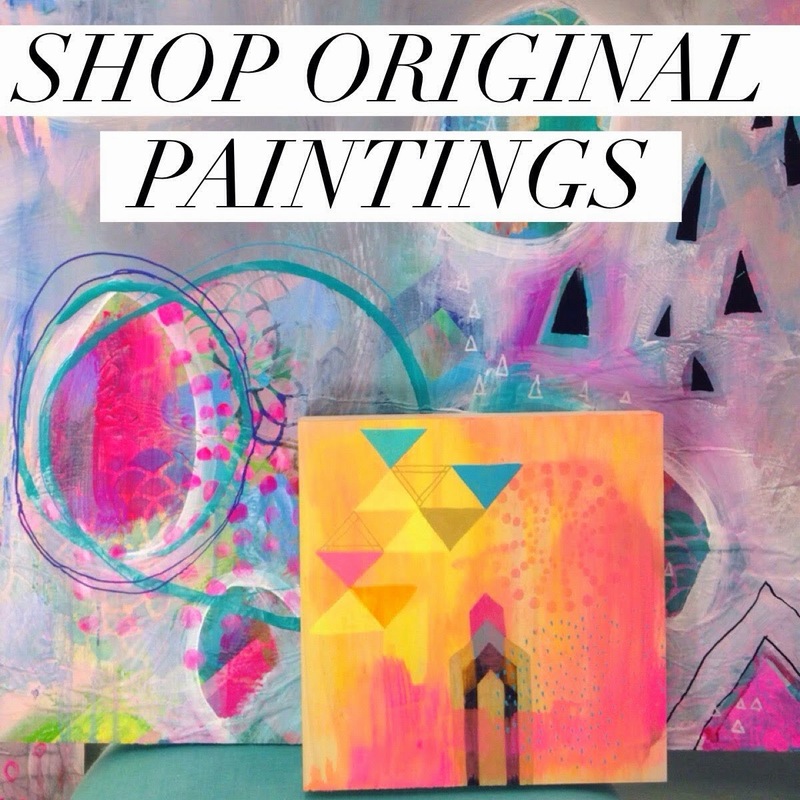 Each participant will go home with a finished 2 by 2 foot layered mandala painting of their own creation, ready to hang right in your favorite spot. Your teacher, Faith, brings years of art experience. 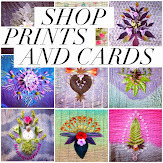 In the course of the workshop she will offer lessons in collage, silk screen techniques, wash painting, and spray painting with stencils. You will add delicious textural layers and personal flair as you introduce all of these techniques with personal meaning, into your painting. Here are two previous students from this workshop, holding their gorgeous work at the end of the day! If you have them, we ask that you bring any favorite acrylic paints, small brushes and acrylic paint markers with you (labeled with your name). 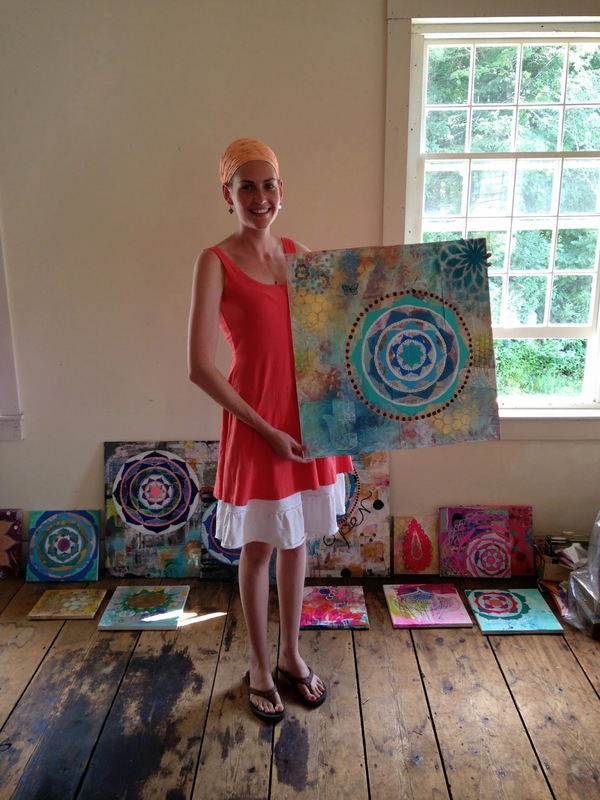 Faith is a painter, wife, mother, doula, world traveler and New York City transplant. With 20+ years of personal painting experience she enjoys inspiring others to manifest their most heartfelt ideas through creating art. 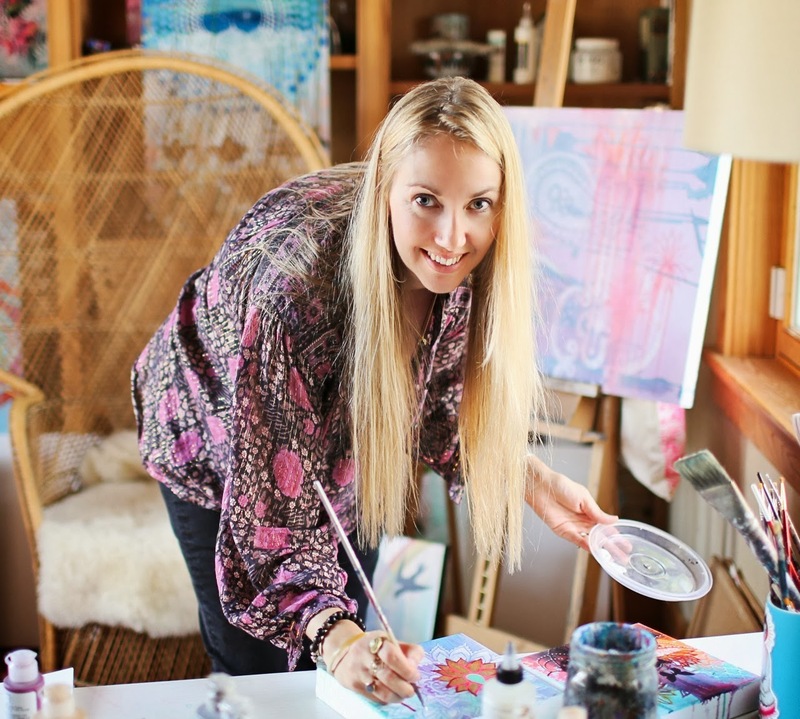 Her art has been exhibited widely, included in multiple publications and she is very excited to have begun offering creative workshops this coming year. She lives with her husband and 3 young children by the sea in Charleston, where they enjoy exploring southern beaches and maintaining a close connection with nature through frequent trips to wild places. Follow along here on her eponymous blog and on Instagram where she posts daily beauty and inspiration.